Where I Got It: The author contacted me and asked me to review the book and she sent me a copy. It's really difficult to summarize this action-packed book without going into too much detail. This is because of all of the twists and turns the novel takes and all of the colorful and unique characters that Ferguson creates. The basic premise is that Bronwyn McCall--an orphan with a good, trusting, and generous heart--inherits a vast tract of land, a lot of money, and a retired MI6 agent named Ernest Rose, whom she calls Jeeves. She sets about creating an impressive compound in Maine, which she populates with a cast of characters in need of a second chance or a bit of luck. Yet not everything is as idyllic as it seems. Throughout the novel--which takes readers from the East Coast to the West Coast and across the Atlantic--themes of second chances, loss, loneliness, betrayal, and friendship are explored in a very fast-paced plot. I thoroughly enjoyed this book. Admittedly, I got off to a rough start because there was so much going on, but once I discovered the typical format of a Jeeves novel--that is, the "layers pile up thickly . . . with a character getting into multiple dangerous situations by mid-story" (taken from Wikipedia's article on P.G. Wodehouse)--I was a lot clearer, understood that it was supposed to be so complex, and had smooth sailing. The plot and the overall narrative pull in several interests of mine and the author's, which include Hollywood, food, and fashion. Plus a bit of intrigue. The best part of the story are the characters Ferguson creates. Starting with Bronwyn, who seemed at times like she could be a friend of mine and even drifting into me feeling like I could be her, on down to the minor characters, of which there are many. Jeeves is not your typical Jeeves of Wodehouse's Jeeves and Wooster series. Rather, this Jeeves has a rich past and is full of mystery. My other thoughts and questions about the book are addressed in the follow interview, which I was able to conduct with the author. I am so grateful that she was so cooperative. My questions are in italics. This is such a unique story with a very action-filled plot, which is a characteristic found in P.G. Wodehouse's Jeeves stories (in an early email between us, you mentioned that this was a re-imagined Jeeves, so I figured that Wodehouse's writing played a role in your inspiration; my apologies if I'm wrong). There were so many times that I wondered what could possibly happen next and then you threw in another twist, which I really enjoyed. What was your inspiration for this novel? I have to admit – my inspiration was simply my imagination. I’m blessed with a vivid one. One of my first mental images was seeing Bronwyn walk through the door to her home on the estate. And I’d mentally polish the story before I ever began writing it, like polishing a stone in your pocket. It was always there, and I’d trot it out and see where it took me, just in my imagination. Some people have a mantra – something that relaxes them – for me, it was setting my foot into Bronwyn’s home and everything else sprung from that. As far as Wodehouse is concerned, I always adored Jeeves, and of course this Jeeves is unlike the original. But there’s still something endearing about him. The plot of the novel takes the reader to so many places--England,California, and Maine for starters. Did/do any of the places you mention have a special meaning or how did you settle on them for the setting of your novel? I loved Maine from the first moment I crossed the border from New Hampshire. There’s something very unique and resonating about it. I’ve been to California a few times, but it’s my love of movies that launched the California locations. Pittsburgh is easy – I’m from Pittsburgh and live nearby … a terrific place. People here enjoy reading about the real places in the city, and in Sewickley and Beaver. Unfortunately, the UK locations are a result of research. I hope to get across the pond one day. Bronwyn is such a friendly character that I feel like I know her and at times like I could be her and you create such a colorful and rich cast of characters. Were there any that were favorites for you? Were many of them drawn from people you know in real life? None of the characters were based on real people, but I can’t say the same for the dogs or Snowball the cat. Those are definitely based on real animals. I’m delighted you related to Bronwyn. I liked her interaction with Clive and Jamie. I always felt their friendly camaraderie, and it reminded me of Harry, Hermione, and Ron … and Tom Sawyer, Becky, and Huck Finn. I think they had a great time on the estate and it’s a bright spot in the story for me. And I was very fond of the fox. Second chances play a major role in this novel. Why was that such an important theme for you? I began the idea of the story with Bronwyn’s own second chance, and as I got to know her more, I realized how generous she was. Despite her lonely life, she had a big heart, and I think she always would have exhibited generosity even without her enormous fortune. One of my favorite second chances was the one for Laura – in “Irony”, Bronwyn was stunned by what she perceived to be Laura’s disloyalty, but two chapters later, in “An Umbrella for Laura”, Bronwyn not only offered her reinstatement, she did it with understated kindness. As far as a theme, I think it’s something we sometimes overlook in ourselves – our willingness to believe again, to rescue something or someone, to trust again. Fashion, food, and design seem to be an important part of your descriptions. I know from your author blurb that you were involved in fashion before becoming a writer. Was there a reason these came up so much? (Hobbies for you, etc) Similarly, movies and Hollywood play a big part in the novel. Why was this? Fashion, food, and design all interest me and always have, so incorporating them in the story was a must for me. I guess I can say, I wrote the book I’d like to read. And I’m a huge movie fan, so bringing movies and actors into the story was easy to do. The food aspect was such a blast to write – almost all of the restaurants are real places, as well as the food, with the exception of Nuit. Added as an afterthought to elaborate on her answer...To illuminate characters and their lives, I like to add color for readers with descriptions of the things that interest me, like what the characters look like, eat, and their environment. But if the story is an 'orchestral piece with lots of instruments', there's a point in the story when it's simply 'a mournful cello' (think Phillip Phillips and his Volcano single). In chapter ten, it's a departure to see the story unfold from Jeeves' perspective and it's a chapter without dialogue. Bronwyn's circles in the sand, her offering of carrots with green tops, and the lapping ocean have kind of a reverence, seen from a distance ... and it marks the first second chance (for Alex Oz King) and the launching point of new lives for both Bronwyn and Jeeves. It's a quiet and significant break in a story with tons of descriptive passages. As I mentioned, you were in fashion, but the author blurb mentioned that you also managed a bookstore, and now you're a writer. What made you decide to transition from one area to the other? Had you always wanted to be a writer or did the urge suddenly come to you? Did you have a background in creative writing or literature? I left department store retailing to manage a college bookstore, and I did that for 27 years. It was a great career and I was proud to create a unique and successful store. Unfortunately, the college leased the store to Barnes & Noble. I didn’t plan on retiring, but it did have an upside – I could write the novel I’d been outlining. I remember when I first said I was going to write a novel … I was so shy to say it out loud. But I knew the story, and it was just a matter of writing it. I don’t have an English background, other than having success in English classes and being an avid, observant, and appreciative reader. Going off of that, do you have any advice for someone looking to get into the world of writing/publishing? My advice for budding writers is to be prepared for the slog of getting published and the challenge of marketing your book. The writing was always a complete and utter joy for me - even editing, which I did over and over and over. I can’t imagine writing if it’s not the most glorious part of the day. I would also comment on how important it is to have cold readers (who will be honest) read your early manuscript drafts. I created a questionnaire and took heed when readers had questions or something in the plot line wasn’t clear to them. I do think a reader needs to ‘think’ and my approach isn’t to spell everything out. In fact, I think readers should have different opinions and interpretations of what happened and in the case of North, different views of Ernest Rose. But I did do some clarifying and rewriting to fix things the cold readers brought to my attention. If you don’t have a questionnaire, your cold readers might be vague. What authors or books have influenced you the most? Who/what are your favorites? Did any of them influence your writing style? I’m a wordy writer. My early drafts were much longer, and much of my editing was all about the word count. I learned to have more efficient sentences. Many of the classic writers that I admire are succinct – Hemingway and Fitzgerald. But I’d say the feel of my writing is similar to John Irving’s. And what reader/writer doesn’t admire the world JK Rowling created? I’m a huge fan of the Harry Potter books, and although Bronwyn’s world doesn’t have the magical aura of Rowling’s, or the unbelievably creative language, I did try to have lyrical names that would steer the reader’s subconscious … for instance Bronwyn thinks red hair is wonderfully special. No one else in North has red hair, except for her long-gone family and Snooks. But Bronwyn’s name should reinforce to readers that her hair is brunette, brown, brun. Splash Flanagan is a favorite name for me, Grace Cloud imparts the qualities Hughie would long for … Ore is certainly a ‘golden’ actor, beyond handsome, so I used the name Ore to convey his golden nature. Finding the ‘right’ names for the characters was important, and I hope I was as successful at that, as JK Rowling. Any thoughts on what's next? I’m outlining a new novel. 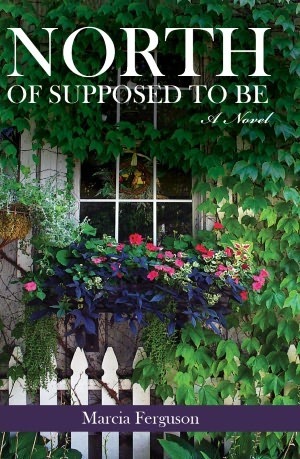 At first I thought I’d write a sequel to North of Supposed to Be, because early readers were anxious to know what happens to Bronwyn and the rest of the characters. So right before it was published, I rewrote the final chapter and hope it satisfies the readers. The new novel has fewer characters, but they’re good ones. I can’t imagine writing about characters you don’t truly love. I noticed you’ve created Pinterest boards that relate to the novel. What’s that about?